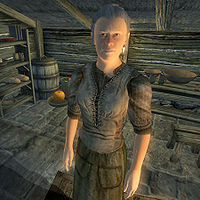 Erline Lirrian is a Breton commoner living in Bruma. Her husband Bradon Lirrian was recently slain by questionable vampire hunter Raynil Dralas. Erline is convinced her husband was not infected and will plea for your help during the related quest. She wears a common lower class outfit, consisting of a coarse linen shirt, green felt linens and stitched leather shoes. She carries a bread loaf, a small amount of gold and the key to her house. 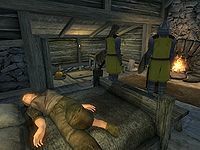 When you enter her house you will find her husband Bradon dead on the bed and the widowed Erline in the company of chief investigator Carius Runellius and a Bruma Investigator Guard. When you get near Erline, she will just say, "Please leave me be..." and continue wandering restlessly around the small cabin, eating three-hour meals at noon and 8pm. After Carius has told you the terrible tale on how Bradon was slain by the vampire hunter and added: "Luckily, Bradon's wife wasn't home. Poor thing, she didn't even know her husband was infected." she will change her greeting to: "Perhaps you can help me." inviting you to engage in conversation. Upon entering conversation, she will express her grief over her husband's death: "I can't believe this is happening. Please... please. I need your help. My husband was no vampire! It's ridiculous! No one will listen to me!" After you calmed her down, she will continue: "Forgive me. I loved my husband dearly, and to lose him this way makes no sense. Anything you can do to help would be wonderful. This is all happening so fast." She will then explain the events from her viewpoint: "I came home only just a few hours ago. I found the door open, and my Bradon dead. Standing over him was a Dunmer. I screamed and ran out into the street. Some city watch were nearby and heard me I suppose, as they arrived quickly. 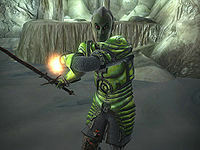 I heard the Dunmer identify himself as Raynil Dralas. He said he was a vampire hunter and that Bradon was his mark. The guards seemed to know about Raynil, and after a search of the house, the body of some beggar was found stashed in our basement. The guards sent for Carius, who is an investigator for crimes here in Bruma. In minutes, Raynil convinced Carius that Bradon was a vampire." After pointing out the evidence looks bad for Bradon, she will angrily express her opinion: "Well of course it does! It was obviously planted here. Why would he stash a body in his own house? That's ridiculous! And another thing. The guards are making a big deal out of no one seeing Bradon out in the daylight. Well of course that's the case! He works at night, and has to sleep during the day. Why does that make him a vampire? It's all that Raynil character. I don't trust him. The thing that bothers me the most is that I swear I've seen him before. Of course he says he's never been here. Look, there isn't much more to say. Please... help me clear my husband's name." When asked about Raynil Dralas, she will say: "I have no idea where he'd be. Just find him, and make him tell you the truth. I swear, he's a liar!" She will close the conversation with the words: "I know I sound desperate, but I know I'm right." After this conversation, Carius Runellius will reassure you the investigation is over: "I'm sure Erline is very upset. She'll be safe though; Raynil has confirmed with us that she isn't infected. Her accusations that Raynil is lying is not surprising. At this point, she's so upset that she'll say anything to deny what really happened. I suppose if I found out a loved-one was something as horrid as a vampire, I'd find any excuse not to believe it either." Later in your investigation, when you question Olav, he will hand you the key to Raynil's room with the words: "I always liked Bradon and Erline. They were a nice couple. I hope you get to the bottom of this, cause I don't believe he was a vampire either." After finding Gelebourne's Journal, she will confirm his relation to her husband: "Yes, I remember Bradon mentioning that name once. He was part of the brotherhood he had created with Raynil." After your encounter with Carius at Olav's Tap and Tack, she will have additional information: "I knew I'd recognized Raynil! I think when I first met Bradon many many years ago, he introduced me to him. They were part of some sort of brotherhood. They would roam Cyrodiil in search of legendary treasures and the like. The only reason he stopped doing that is because we got married, and he wanted to settle down. I'm afraid thanks to Raynil, that time is lost." She will send you on your way to Boreal Stone Cave with the words: "Travel safe. Raynil wouldn't think twice about harming you." If you let Raynil escape by breaking the 24-hour limit given to you by Carius, she will refuse to talk to you: "There isn't much more to say. I'm sorry." After you have talked to Carius, however, she will say the following when asked about Raynil: "Oh... I see. I know you meant well... and I suppose there was no need to put your life on the line for a stranger. I'm sorry, but I have much to do right now. Please excuse me. Oh, and you should inform Carius of this if you haven't already." If you return from Boreal Stone Cave with the Mundane Amulet in hand, she will tell you the whole story: "Long ago I made a promise to Bradon. I promised to never reveal to anyone what I'm about to reveal to you now. However, because you've avenged his unjust death, I feel that Bradon would understand why I'm breaking that pact. Bradon told me about this amulet when they first brought it home from whatever distant land it came from. He never really trusted anyone else in the group, and before he secured the treasure in that cave, he had a special enchantment placed upon it. The magic masks the true identity of the item. All it takes is a simple command word, and the amulet would be restored to its true state." When asked about if the 'command word' died with her husband she will respond: "No. He always feared this day would come. He left me knowledge of that word in the event that he died and I came into possession of the keys. If the other members of Bradon's group were still alive, and I on my deathbed, only then would I pass the knowledge onto them. If you'd give me that amulet, I would like to show you what you've recovered." When you hand it over, she will say: "Thank you. I will now speak the word. Brotherhood." This will unlock its true power, turning it into the Phylactery of Litheness: "Here is the amulet back. It's as beautiful as it was the day I remember seeing it long ago. I want you to keep it, as I have no use for this anymore. I'm certain that's what I want, and I'm certain that's what Bradon would want. I thank you from the bottom of my heart. I hope that the amulet helps keep you safe on whatever roads you may travel." Asking about Raynil will make her express relief: "I'm glad he's dead. I know that's a horrible thing to say, but I think you understand." Her final words to you will be: "Justice has been done." After the quest is completed, Erline will start a new and slightly changed life. She will still eat two three-hour meals a day, at 12pm and 8pm respectively, but will now sleep from midnight to 6am. After waking up, she leaves the house and enters the Great Chapel of Talos for a single blessing of Willpower from Mara. She returns home for her meal at noon and spends the rest of the day wandering around inside the now empty house. This page was last modified on 9 November 2018, at 22:45.